It’s only fitting that one of the hardest Ironman races on the circuit should also produce one of the longest posts. 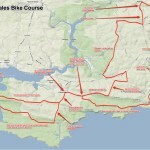 Since Sunday I’ve received a couple of power files to analyse and have been promised more; I’m keen to see a sample of how this race is tackled, it’s a tricky course to master. To start though I’ll look at one of my own athlete’s performances: Ben Unsworth finished his season with an Ironman having focussed on sprint up to middle distance races throughout the year. 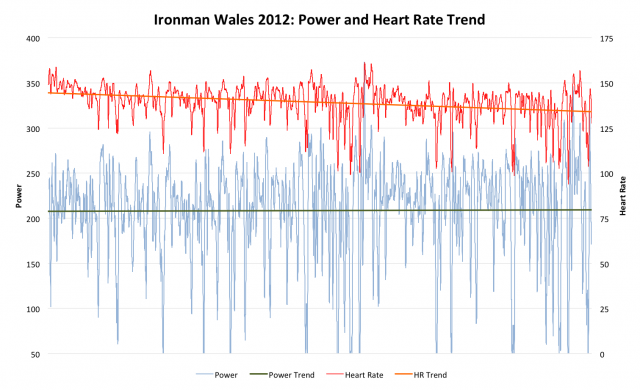 Through the summer he generally trained for around 8 hours per week, only pushing the volume in August, one month before Wales; not your typical Ironman preparation. 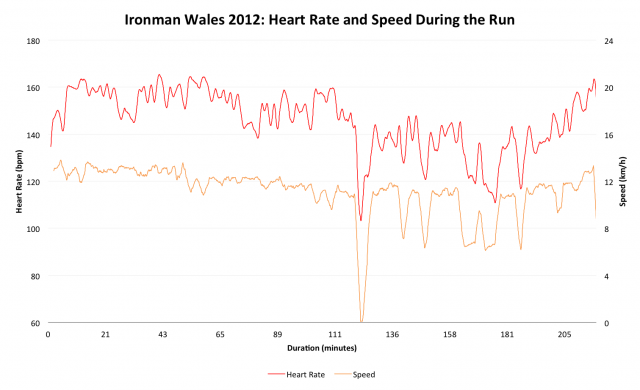 The profile of the bike course is perhaps the most defining feature of Ironman Wales – climbs aren’t that long and only occasionally that steep, but over the entire 112 miles it is simply tough. Before analysing Ben’s performance on the bike, it’s worth looking at the profile (as recorded by his Garmin) to appreciate the impact it would have had on his day. Up and down, this is not an easy route to pace; we can anticipate quite a variable power output over six hours of riding. The usual caps applied: controlled effort throughout, but especially on the climbs, the aim – of course – to avoid seeing wattages around FTP. Ben’s preparation for this Ironman left a degree of uncertainty about overall endurance, good reason to be cautious on the bike. 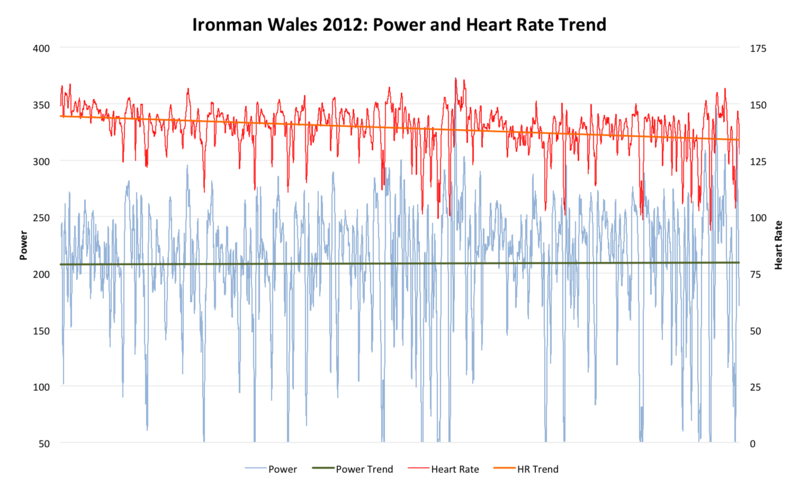 As the above power profile shows he held a very consistent average power the entire day all with declining heart rate. The lengthy swim transition was a likely contributor to the initial high heart rate, that it settles to much lower values by the end of the ride suggests this was within Ben’s abilities and comfortably paced. Unsurprisingly on the undulating course his power fluctuates a lot around that stable average, while early signs suggest he was riding well, did he dig deep too often? 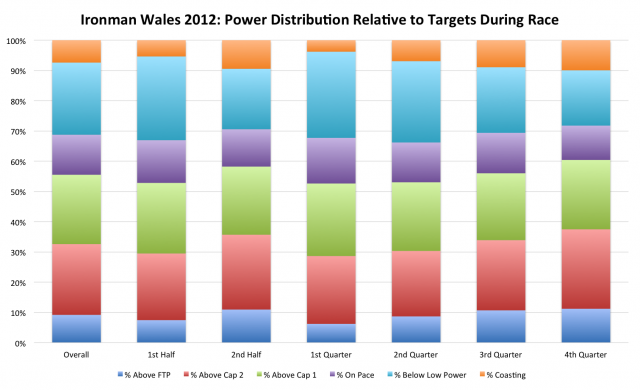 Summarising the data into quarters gives an indication of that variability. Each quarter in the chart above is similar in distribution, unsurprisingly a lot of time is spent above power cap 1, but also around 30% of the time is below 68% of FTP (low power) or spent coasting. 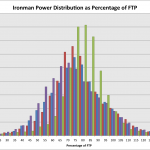 A relatively small 10% of the ride is actually spent within the 68-75% of FTP range that is set by the main cap. Variability may be discouraged, but Ben manages to increase his effort in the second half of the ride, finishing with a strong fourth quarter. Since I last analysed a race on this blog (Paul Deen’s Roth 2012 performance) I’ve further extended the capabilities of my analysis system to include a much more detailed breakdown of events; the table above is one of the results – a large collection of numbers offering statistics for 10 or 20 minute segments of the race. Overkill? While it’s hard to read it does offer the potential to pick out significant periods in more detail, perhaps to spot any particularly costly burst of activity. In terms of the power caps it is better present in the form of a bar chart, a higher resolution version of the quarterly breakdown. Making this chart easily readable is the biggest challenge, a large amount of data is represented in this colourful block. It is fundamentally the same information as the quarterly breakdown, but now in ten minute blocks of the race. You can see periods where Ben was spending half the time above 85% of his FTP (Cap 2) and more worryingly occasions where over 20% of the time was above FTP (220 minutes in); you just need to look back at the course profile to guess where these are. 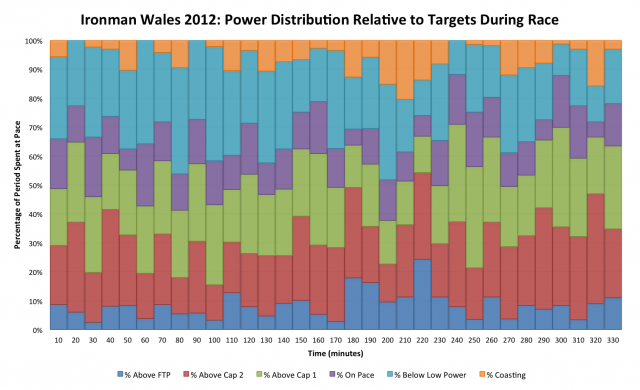 Wisemans Bridge and Saundersfoot are prime candidates for above FTP efforts, but the steepest sections are relatively short. Of more concern would be the consistent amount of work above 85% of FTP and beyond. A steady averaging of power over the course is good, ideally we want it delivered through as consistent power output as possible. In theory, with a suitable range of gearing, any course can be ridden at a consistent power output. In practice this won’t happen. A degree of variation is expected and minimising this variation is encouraged as it removes excessively costly spikes in power along with wasteful drop offs. In looking at a course I would general apply standard ranges, expecting a Variability Index (VI) between 1.00 – 1.05 for a largely flat course, but perhaps up to 1.08 for much hillier course. Overall Ben hits a VI of 1.09, just outside the range we hope to target and as the detailed breakdown table shows there are moments well above this. Not ideal, but much as I may comment of the amount of time spent outside of his race zone, there is a degree to which this is simply a product of the course. It will be interesting to compare a few more data sets from Wales and see whether others ride with more consistency. Ben entered transition off a hard bike, in fact the Training Stress Score (TSS) for this ride hits 370, not a good sign for an Ironman run. Again, I suspect we could regard higher than usual TSS as a feature of this course – I wonder how many athletes further up the field were hitting 320 or more. As high TSS is indicative of an energetically costly ride then we obviously expect it to have greater potential to degrade run performance. Before I look at what happened to Ben on the run, here’s the profile to place the course in perspective. 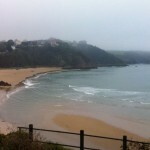 Ben took on food and managed to recompose himself to finish relatively strongly – the lure of the finish line. He crossed that line in 10:50:51, not his best performance, but a respectable time in Wales. Given the season that led into this race I think he can be pleased with the result. The swim – which I’ve neglected to mention – was within his means, a fast time aided either by a slightly short course or currents. 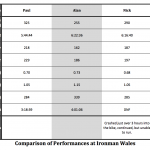 The bike was most likely overly aggressive for the training that has been done; perhaps this reflects the predominance of short-course racing over endurance training. The run was an inevitable product of a hard race combined with the lighter build and that earlier aggressive pacing. Still, Ben pulled through and managed a respectable result. Looking at the next season it’s clear that while Ben can race well off a lot of short course work and a relatively short block of Ironman focussed training to perform better over long distance next year that focus needs to start sooner. We can look back to the season before for a template which brought Ben into good form for Challenge Copenhagen.